the master machinist to lecture me again because he is an M.I.T. grad with his own metalurgy lab and machine shop......I mean the rest of you. I understand machine shops bore and build engines..upholstry shops sew tops and seats...but..all the in between.. The harley guy that says he likes to work on stuff,but wants leads for a restoration shop ?? Boz has to be writing a fat one to Mr Colorite.. I loved that 41 z conv mentioned in the post below, ebay..how much...invested sold for 69.....?? ""This is a very rare 1941 Lincoln Zephyr Convertible Coupe that has been restored to show quality condition. It is one of 20 known survivors of this Zephyr model and body style as registered in the directory of the Lincoln-Zephyr Owners Club. This car is the 52nd of 725 total convertible coupes produced in 1941. Over $100,000 in restoration costs over a period of six years has resulted in the magnificent automobile""
Do you paint?? weld?? home in the garage?? is it a hobby or an investment like the guys in oil futures?? this forum just isnt the same without him.. I guess I'm both. To be clear, while I'm having Ed handle the bodywork and interior, I was the one who rebuilt the transmission and rear-end, ran-in and detailed the engine, sandblasted, bodyworked and painted *all* of the chassis pieces, rebuilt the brake system, etc., and I'll also be responsible for final assembly including the electricals -- so I haven't gotten off easy! I work on stuff, but, when it comes to safety like brakes,i leave it to people who have worked on these, since they were brand new! I did **everything** on our 1947 Continental: stripping, painting, engine and driveline replacement, 6-way electric seat, electric windows, power (drum) brakes, power steering, complete wiring, started installing a 1957 Lincoln a/c but never finished it - didn't really need it in California. My wife and I DROVE this car from California to the LCOC National Meet at Mt. Snow, Vermont in 1970. It was my daily driver for some ten years and nearly 100,000 miles, when the cheapskate vinyl upholstery gave out. I replaced the brakes and installed a power booster on our 1941 Continental. I also reworked the front seat brackets to move the seat back about 4 inches so I could get in and out of the car. My next project may be the installation of a 1957 Thunderbird turn signal switch which will enable THREE brake lights instead of just the one. (It has worked well on the '47 for some 40+ years). BUT, I'm running out of steam! I've had the '41 Zephyr convertible project car for several years and the only progress I've made on it is a partial disassembly, a brake job and an assassination of a rusty '41 Zephyr 4-dr sedan parts car. In the meantime, I have TWO unique 1967 Mustangs that I need to sell. I did **ALL** the work on both of them and now I need the space that they occupy. They were both daily drivers in California and were DRIVEN (not trailer-ed) to Texas in 1993-94. Now we're spoiled by our 1997 Lincoln Town car. In 1962-63, I built an early Street Rodded 1939 Ford Convertible. It had a bone stock 1958 Chevrolet 283 engine and a Columbia Overdrive. I drove this car between Riverside, California and Omaha, Nebraska and Cheyenne, Wyoming four times a year for two years. I used two 1941 Hudson Drivemaster vacuum solenoids to control the Columbia with a dimmer switch under the clutch pedal. This setup REALLY faked out passengers when I went through SIX forward speeds and only touched the shifter three times! I also installed side door glass from a 1940 Ford Convertible (to get the vent windows) and a 1950 Ford fresh air heater (required in Nebraska and Wyoming in the winter). One of the fog lights had an aircraft landing light in it (for fast night driving across Kansas). After I broke three Columbia axles, I replaced the driveline with a Chevy overdrive transmission and a 1958 Ford pickup rear axle (to retain the 5 1/2 inch bolt pattern). This was a **REALLY** fun car and is probably the only car I regret selling! (By the way Wes, brakes are probably the EASIEST repair that can be done on these cars). I'd like to do it all, but don't have the facilities. After spending 30 yrs at Ford Motor, I have learned (and done) most all the processes from Foundry, to Frame, Stamping, Glass, Engine, and Specialty Plants (like Manufacturing Development). I also have a trade. I sew my own headliners and seat covers, rebuild my own engines, metal finish/polish body metal, set windshields/backlights/side glass, wire & troubleshoot, MIG and stick weld, and assemble everything (including rear-end gears, brakes, steering, exhaust systems, and trim). I can paint, but I don't have a booth or spray equipment. I can plate, but I don't have chemicals, rectifiers and tanks. I can machine parts, but I don't have the machines. What I do have is lots of friends with those resources. We trade work regularly. I just got my front & rear bumpers, grill assembly, and other parts back from the chrome plater. Know what it cost? I wired his mother's detatched garage. My painter charges me $10/hr + paint. He's a friend-of-a-friend (we're all restorers) and he has his own booth. I can spot-prime, but he paints whole cars every day. That's hard to beat. So far on the 41 LC Cabrolet I have, I have done most all, rebuilt the V-12 after sending it out for the machine work. Did all of the body work which was considerable and close to paint finally. Just finished up rebuilding the rear axle, all new bearings and races, including sandblasting and filling pitts which seemed to take forever and painting the whole assembly. Blasted, cleaned and put new wood in the top frame and same for the bows. Wrote the check for the interior as that is way past my capabilities and I wanted it right the first time. Also wrote the check for the chrome years ago and it sits patiently on the shelf. Wood grained the dash and though nice, is not accurate so I wrote the check and bought the plate and various paint needed to woodgrain it again as original. Started out with a set of NOS Aluminum heads and spend one winter polishing them as well as the intake manifold. What a job but they all turned out nice. Wiring I bought years ago from Narrangaset and it also sits on the shelf ready for the time to go in. That I will do myself. The paint work I will do myself, at least the under side of everything with color and the engine bay. If those come out nice, which I expect they will, I will continue on to the body. The worse that can happen on that is a bug might land in it (and probably will) I have a plan B for the paint and a friend that owns a shop with a downdraft booth. So that is an option for the final coats of color. Bought a rotisserie and mounted the body so I could get to the underside of the car. Weeks later after blasting and filling every pit in sight, painted it and looks great. Same for the interior sheet metal. A good friend and long time LCOC member told me one time I would never get this car done as I am way to paticular. Fussy I will admit to and I cannot tell you how many times I have redone items on this car to get it as perfect as possible. But I finally see light at the end of the tunnel. I am doing this for my on pure satisfaction and love to tackle things that are different. My only regret at this time is that I didn't finish this car years ago. I would have had years of fun under my belt by this time. I also learned years ago that sometimes you cannot beat a man at his own game. With $3000.00 in leather and no sewing machine heavy enough, nor the experience in doing upholstery, I felt the money was well spent on having the interior done. YOU GUYS ARE IMPRESSIVE....HEY PHIL, TELL THAT DUDE ABOUT YOUR MUSTANG..HE WANTS TO PARK HIS 66 AND DRIVE A CHEVY CORSICA (EEK)CAUS A MUSTANG CANT DRIVE ON THE HIGHWAY IN CA....???? I DRIVE MY 67 PONTIAC ON THE HIGHWAY IN OHIO 10S OF THOUSANDS OF MILES ..AND IF A GM CAN DO IT....AND A ZEPHYR CAN DO IT..CANT A MUSTANG?? 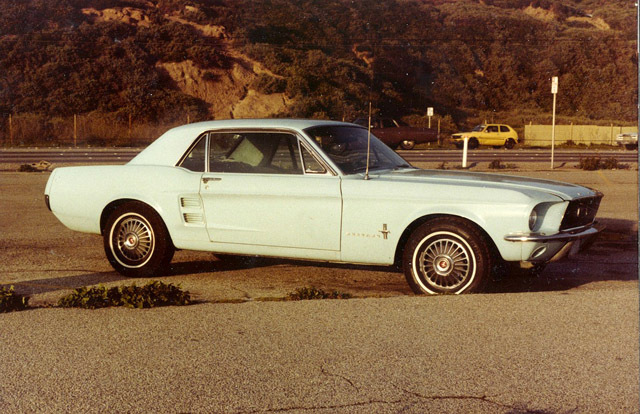 I drove "Old Blue" (my 1967 Mustang coupe) over 165,000 miles in California, Arizona, Montana, Idaho, Washington, Oregon, etc. between 1982 and 1994 (including a relocating trip to Texas). It *CAN* be done, but it's not safe any more (if it ever was). After totalling our 1997 Town Car in a head-on collision with a Buick Roadmaster making an illegal left turn in 2006, I'm VERY leery about driving **ANY** old car in today's crazy traffic - even in Texas, not to mention California! The seat belts and air bags in the Town Car probably saved our lives. My wife and I and the lady in the Buick all walked away with only bruises. We only take our collector cars out after peak traffic hours and then not for any long trips. Too bad too, because the '39 Zephyr with the Columbia axle can keep up with almost any traffic and it's fun to drive it. I still take my old Mustang out on a regular basis, but it has the factory disc brakes which are absolutely super and make heavy traffic tolerable. I took it up to the GOF in Pennsylvania last year. While the car did fine, my back was pretty sore by the end of the trip. Those foam bucket seats really didn't offer much support. I've upgraded all my Mustangs (all 1967s) from the original 4 piston caliper front disc brakes to the single piston floating calipers used on 1968-71 Mustangs, Torinos, and Cougars. They work really well. 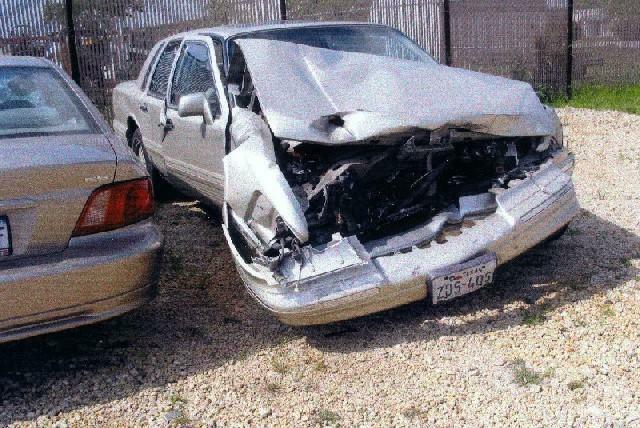 BUT, in the event of a crash like the one that totalled our Town Car, the ability to stop quickly is not the issue. Survival of that kind of an accident without restraining seat belts and air bags is an iffy situation! We were in the right lane of a 4-lane highway with a car in the left lane waiting to make a left turn when this Buick Roadmaster instantly appeared in our path. The driver was making a left turn and claimed to have been unable to see us because we were masked by the stopped car in the lane to our left. Granted, in hindsight I should have been more observant, but we were on a street we use nearly every day - a very familiar surrounding. Reminds me of the story about the "little idiot" who moved because he heard the most accidents occured within 5 miles of home. 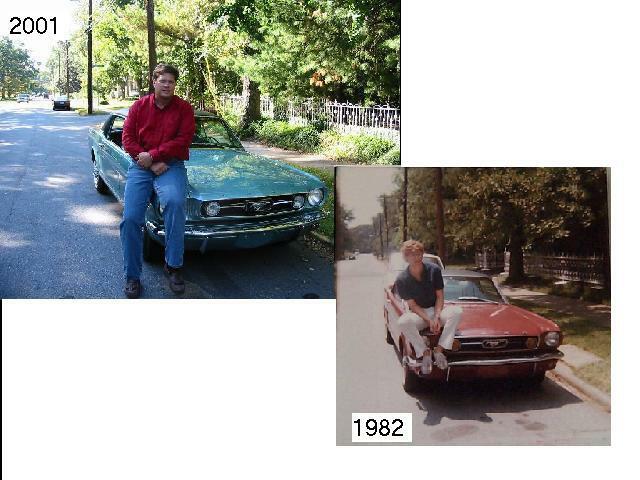 Cecil is absolutely correct, those Mustang seats don't provide a lot of support. I wonder now how I drove those cars so many moles! I did everything but the chrome work and the upholstery and machine work to bore and clean the block. Spent 6 years getting the car done and drive it as much as I can, its an investment but who cares if you cant have fun with it, you only live oce and cant take your toys with you so enjoy them while you can. it can always be restored again. v12, well said. I drive mine as much as I can, too. I cry when I hear of cars that NEVER go outside of the garage, and the owner spends his life polishing it FOR SOMEONE ELSE (who couldn't care less about cars). Just two weeks ago we saw a grand-daughter who wanted to sell her grandfather's pride-and-joy Buick (at the best price possible). What a legacy the old man left in the hands of people who just want the cash value. I didn't mean to imply that we NEVER drive our collector cars! We just pick our times when the traffic is light and drive VERY carefully! It would seem that the folks who participate in this forum are "hands-on" people who appreciate their cars for their aesthetic appeal rather than their dollar value. I have never viewed our collector cars as an investment to be bought at the lowest price in hopes of making a fortune. I own them because I LIKE the cars! I guess most of the "High-Roller" investors have little or no interest in the actual vehicles, they just want to hang on to them until they can be sold at a profit. That's what auctions are for, I guess. electric fuel pump was installed directly above the rear axel. but below the body stop. smashed!! car has new wireing but the quality so far who knows whats next. gas in tank so bad that the neighbors are asking about that smell. What i want to stress is that i try, and the things i learn on the boards like this one are great sort of like learning from my own misakes but they are not mine. i read these almost daily and keep on learning. and last i could not own a $100,000.00 car i would be afraid of it. no driveing no tinkering no touching it not my style. My restoration below has been completely done by myself, my father, and my brother, other than rebuilding the engine. We paint, wire, strip, blast, clean, weld, you name it. I'll have it professionally painted when it's ready, and I'll probably have a trim guy I know touch up the swapped interior. Thanks for including some of my projects in this forum! I'm gearing down these days. I still have some projects, but I'm losing the ambition to complete them (at age 82)! 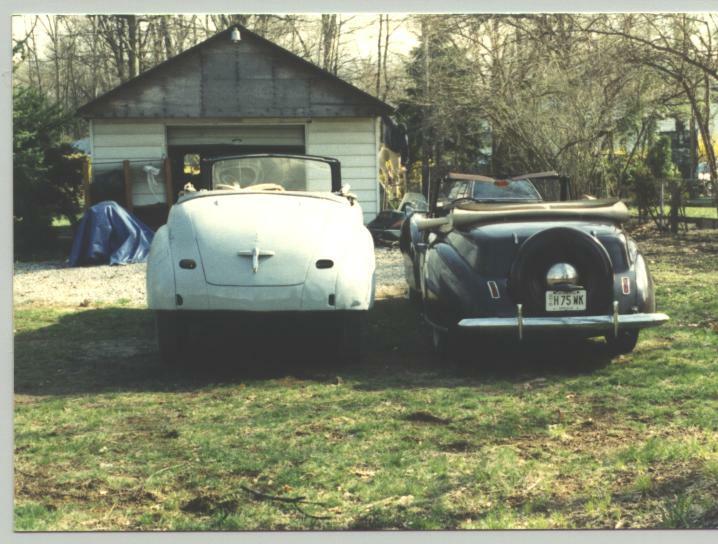 If anybody out there wants a mostly original 1941 Continental Cabriolet, let me know! It's disappointing to look at the place where my photos used to be before "Webshots" went out of business! BTW-Rolf Burdette passed away several years ago. I still miss the old curmudgeon!